<?xml:namespace prefix = v ns = "urn:schemas-microsoft-com:vml" /><?xml:namespace prefix = w ns = "urn:schemas-microsoft-com:office:word" />This line from Exodus is not meant to teach us simply of Pharoah’s ignorance of Joseph the man. It is meant to warn us of the dangers in the rejection by the privileged of practices of basic decency and respect that allow for just and equitable treatment of all people. 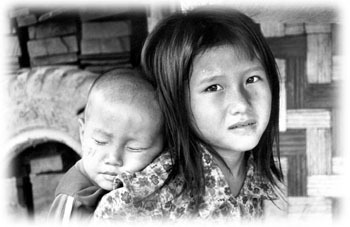 Practices that even in a time of famine and privation provided a flow of well-being that the dignity of every human life deserves. Sam Walton and the businesses he created have been hailed as dynamic and revolutionary corporate models that established new paradigms for business to follow. In fact, the Wal-Mart formula is as old as the Pharaohs and as jaded as the worst excesses of the robber barons of the Gilded Age. Exploited colonies of slave labor producing profits for masters exerting powers of extortion that would put the Borgias to shame. But like all evils of the past, these citadels of ill-gained lucre will be stormed, this time with no monuments left in their wake as mute testament to overbearing avarice and greed. The closure by Wal-Mart of its Jonquière store in the midst of negotiations for a collective agreement is simply the latest in a long history of cynical and destructive machinations that this colossus has imposed on suppliers and workers alike. The policies of this company, standing astride the corporate world more as dictating nation-state with 1.4 million employees than as competitive adversary, have single-handedly been responsible for more North American jobs lost to <?xml:namespace prefix = st1 ns = "urn:schemas-microsoft-com:office:smarttags" />China, and the other slave labor markets of the East, than any other single entity. It’s trade with China alone is greater than Britain and Russia. This company, that in the late 1980s and early 1990s trumpeted its claim to "Buy American," has doubled its imports from China in the past five years alone bringing it to nearly 15% of all Chinese exports to the United States. Yet for this behemoth, law and legislation, rule and regulation, that seek to support a minimum level playing field for workers and vendors are mere annoyances meant to be avoided, manipulated and suborned. Michael Fraser, the United Food and Commercial Worker's Canadian director, says of the Jonquière closure that is "…clearly a violation of workers' right to unionize…" and an unfair labour practices charge will be filed with the Quebec Labour Relations Board. Yet Wal-Mart’s well-known anti-union stance is only part of the picture of its arrogance. The company expanded into Canada in 1994 and has since opened more than 230 outlets, including 44 in Quebec. It employs approximately 60,000 people in its Canadian operations. The company's slogan, Always Low Prices, is often altered by critics to read, Always Low Wages. The average Wal-Mart employee earns $13,860 a year. Five thousand dollars below the Federally established poverty level for a single individual. Ontario's Workplace Safety and Insurance Board has reported that the company has been fined $500,000 after pleading guilty to 25 charges of failing to notify the WSIB within three days of learning of injuries to its employees as is required by law. The agreed statement of facts submitted to the Ontario Court of Justice does not disclose the severity of the injuries, but cites 25 occasions in the past four years where Wal-Mart failed to report injuries "…which necessitated health care or resulted in the worker not being able to earn full wages." 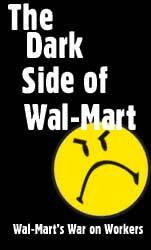 Because of its power to squeeze profit-killing concessions, Wal-Mart’s treatment of suppliers can be just as brutal. Low prices come with a high cost. It’s relentless pressure on vendors to lower prices or lose it’s business has led some into bankruptcy and others to transfer jobs overseas. Carolina Mills, a 75-year-old North Carolina company that supplies thread, yarn, and textile finishing to apparel makers--half of which supply Wal-Mart-- grew steadily until 2000. But in the past three years it has shrunk from 17 factories to 7, and from 2,600 employees to 1,200 in the face of Chinese produced clothing sold so cheaply to Wal-Mart that they could not compete even if they paid their workers nothing. When Nabisco planned to offer a 25-cent newspaper coupon for a large bag of Lifesavers in advance of Halloween, Wal-Mart told Nabisco to add up what it would spend on the promotion and then just cut the price to Wal-Mart instead. When Nabisco objected, Wal-Mart threatened to stop buying from them. Another supplier, Master Lock of Milwaukee, announced that after 75 years in business it was switching production to China and Mexico. The 1500 positions it had in Milwaukee are now down to 300. It’s plant in Nogales, México has 800. We have been through this before. The Great Atlantic & Pacific Tea Co., the grocery-store chain, stood astride the U.S. market in the 1920s and 1930s with a dominance that has likely never been duplicated. At its peak, A&P had five times the number of stores Wal-Mart has now (although much smaller ones), and at one point, it owned 80% of the supermarket business. Many of the antipredatory-pricing laws in use today were inspired by A&P's attempts to muscle its suppliers. To those who would argue that Wal-Mart has created wealth; and has brought employment to the poor of the Third World; and compels no one to work for them; and that in any case many of the lost jobs have been replaced in our own economy by self-regulating market mechanisms we would ask them to examine the facts. Wal-Mart ‘s destruction of so many small and medium-sized manufacturers and retailers far exceeds any stock market funny-money “wealth” it created. They hurt real people, doing real jobs, leading real lives. Work opportunities have everything to do with options and options are affected by market dominance. Wal-Mart, in many towns, has shut down the competition through ruthless practices. We have not even begun to put a dent into the crisis of job loss due to outsourcing and Canada alone this year will have a net loss of 40,000 to China . That’s the government’s number and is understated. Tens of millions of Chinese are working at an average of 64 cents an hour (and that includes benefits contributed by the state). Beijing-based labor consultant Judith Bannister has pointed out that this vast pool of workers exists because of migration to the cities that was caused by the imposed collectivization of agriculture that drove so many off their land and into urban slums. That provided the cheap labor for the Chinese government that takes 99% of the revenues from the state factories through various Commissions of the Party’s Central Committee. The workers in the sweatshops of the Chinese industrial gulag were a lot better off in their previous agrarian lives. Since the Chinese offer to buy Noranda and Falconbridge 4,000 miners have died in infrastructure accidents on 4 sites administered by China Minmetals . Since the beginning of December China has admitted to over 16,000 industrial deaths in state administered enterprises through accidents and fatigue. The Wall Street Journal entitled a report on these catastrophes “Dying to Work for China…Literally”. Wal-Mart doesn’t create low prices through better productivity, marketing, innovation or distribution. They create it the way the mobs in New York and Chicago did in the 1920’s. With muscle. Wiping out competitors and controlling the foot soldiers. No market mechanism can self-regulate against this type of brute force. Louis Bolduc and the leadership of the UFCW in Quebec are among the ablest and most progressive labor leaders in the country. They were quite flexible and forthcoming in the collective agreement negotiations. Yet Wal-Mart’s Quebec spokesman Andrew Pelletier said that one reason for the Jonquière closure was that union demands would have led to “…a fundamental change to Wal-Mart’s business model by requiring the addition of 30 more part-time positions…” Thirty workers. Thirty workers out of 1.4 million. From where we sit If any business model ever needed a change it is Wal-Mart’s. Cheap prices are all well and good but not at any cost. No corporation, and no complicit government, has a right to inflict a “race to the bottom” on a society. You can't buy anything at any price if you are unemployed. We are shopping ourselves out of jobs and straight into unemployment lines. We are ignoring the difference between the price of something and it’s real cost. We are buying into an unending focus on cheapness without understanding the consequences. We want clean air, clear water, superior education, good living conditions, the best health care in the world--yet we aren't protecting the manufacturers and workers paying the tax dollars that make these conditions possible. We can do better. And the proof comes from our own backyard. Quebec retailer Steinberg’s Inc. was a remarkable example of corporate responsibility. Under President Irving Ludmer it became the third largest employer in the province with 32,000 workers. It’s pay and benefits plans for it’s employees were unparalleled. Thousands of part-time bag packers went to university on its scholarship funds. It’s stores were not the stripped down wastelands of Wal-Mart but were original in design and stimulating to the eye. And its relationships with its unions were so good that labor leaders till today tell me of their admiration for Mr. Ludmer. When Quebec Labor Minister Michel Després says the government has no means to act, that is untrue and unacceptable. Wal-Mart’s closure came in the midst of negotiations on the collective agreement. The government can order a re-opening by Order-in-Council until the end of negotiations. That is the least it should do under its responsibility to enforce the Labour Code of Québec. There are those today who think worker exploitation is a thing of the past. That globalized markets are the panacea to everything. The reality is that the blessings of unprecedented choice many Canadians currently enjoy comes at a dear price in our savagely competitive world. We like to think of ourselves as having superior moral authority in the world, yet we do not lead with authentic moral legitimacy. We remain deaf to the growing evidence that globalization inhibits prosperity as often as it enhances it, and imposes poverty as often as it relieves it. Let us remember all the Josephs of history and let the Wal-Mart Pharaohs know of the promise to each human being that they have a call on the bounty of society’s wealth to which their labor has so much contributed.